Your feet have supported you for years, valiantly bearing your body weight as you hurry to work, exercise at the gym and stand in line after line on a daily basis. Treat them to a little tender loving care with gel socks that moisturize your feet. Here are just a few of the benefits these remarkable socks have to offer. Sandal season is never far away, and moisturized, smooth feet are extremely attractive. These socks, which contain a polymer gel that softens skin as you wear them, lend moisture to dry skin and help smooth callouses and rough patches with the aid of ingredients such as vitamin E, olive oil and grapeseed oil. The warmth of the sock itself helps moisturizers penetrate the notoriously thick skin on the soles of your feet, and the texture of the socks helps massage softening ingredients into the skin as you move around. Best of all, many gel socks contain ingredients such as jojoba or lavender that leave your feet smelling as fantastic as they feel. If you have ever experienced foot ulcerations or dry cracked heels, you know how painful they can be. Not only do they hurt, wounds on the bottoms of your feet can also become gateways for infection. Prevent your skin from tearing by using moisturizing gel socks at least twice a week. If your skin is already broken, wait until it heals and then begin using moisturizing socks to maintain healthier skin. 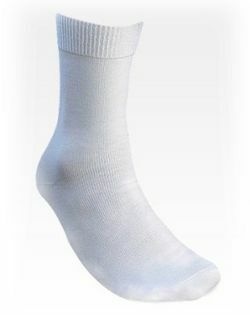 For people who suffer from diabetes, diabetic gel socks that promote circulation or contain special components to care for an amputation site are a must to keep feet as healthy as possible. For those who want to concentrate just on especially dry heels or who prefer to leave their toes uncovered, moisturizing gel socks that cover just the heel are another foot-care option. Gel socks are a great alternative to messy, time-consuming at-home moisturizing regimens and pricey salon and spa treatments. Gone are the days of slathering on overpriced creams and lotions, swathing feet in plastic or reapplying moisturizers several times a night. Forget trying to keep weekly pedicure appointments and spending money on foot-care products that don’t work as advertised. Moisturizing gel socks are a great solution for anybody looking to soften their feet with very little effort; feet are moisturized while you sleep or go about your daily routine. These socks are especially helpful for the elderly or mobility-impaired who have trouble reaching their feet to smooth on lotion several times a day. For someone who might have trouble removing and wearing these socks, they can use sock aids like stocking donners to slide their feet in. Best of all, though prices vary, good gel socks start at around just twenty dollars, and most can be hand washed and reused for up to three months without losing their moisturizing capabilities. If you have been looking for a way to pamper yourself without spending a lot of money or time, or if you have been concerned about the overall health of your feet, moisturizing gel socks are a great investment. Enjoy healthier feet free of the constant pain of dry, cracked skin and get ready to show off your sandal-ready tootsies this summer.